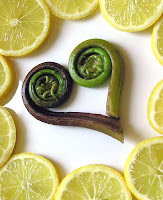 When I went food shopping yesterday I was happy to see Fiddleheads available once again! Although they weren't organic, they were local and I bought a nice big bag. I think I will either steam them and serve them with wild rice or pasta, or try the following recipe from Vegan Yum-Yum. It is now truly spring for me!